cold clay dries this month and the watery walk round the Mere becomes manageable without waders. The starry quantities of buttercups shine with visual perfection. It gets even better when these give way to the ragged Robin and flag irises, with shy orchids hidden at their ankles. 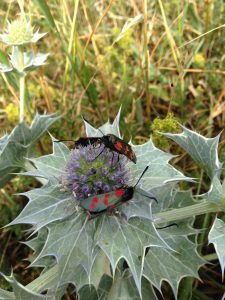 Or how about peering into the flat rosette of the sea holly below the louring skyline of Sizewell B to find it decorated by an exquisite insect? The next thing to do, is to take a mental note of things like these which can be used as future influences in a planting plan. 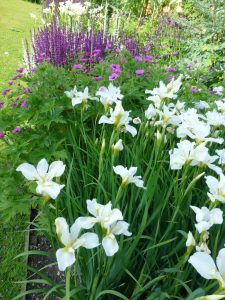 The white irises are a form of Sibirican iris called “Whirling Butterflies”. They add a feel of wildness to a large border. As for that ragged Robin, I once bought one at the Suffolk show but it didn’t survive in the dry soil in my last garden. 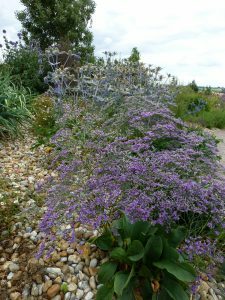 The gravel garden is part of a dry gulch at Hyde Hall in Essex and the sea holly – or eryngium looks fantastic with the sprawl of the sea lavender. This makes a fantastic front of border plant. It looks particularly good with white sedums which are a foil to the lax flowers. Nature is the perfect source for planting ideas. If we learn to look carefully it helps us to make harmonious associations in the plants we choose. 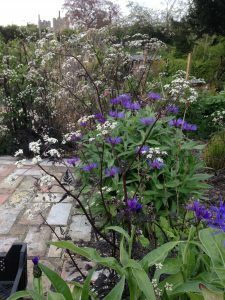 When I was at college one of the best pieces of advice was to ask what look was wanted from the planting. That is to say, what mood was to be pinned down? Jungle, natural, restrained or formal? Which plants can really do that job? If the one you have chosen won’t work in your soil, then look around for one that resembles it and works with the strictures. For a more “natural’ look in your garden here are a few suggestions that might be useful. Gardening fashions have changed in the last 20 years and what I say below is really long-hand for being more relaxed and embracing a sense of place. First, go wild towards your boundaries. Be as exotic as you like near the house but do not plant a banana grove as a boundary hedge. Look through the list of native hedging plants – hawthorn, dog rose and field maple amongst them and make the choice of a mixed country hedge. The birds will thank you as native trees are much richer in insect life and food. Towards this boundary area I would banish Clematis montana and most types of clmbing honeysuckles. Both are lovely plants but their wild birds nest habit of growth means they are unwieldy giants too near to the house. If you have a woodland area, make sure that there is an understory of planting below the larger timber trees. Our English woodlands are rich in holly, yew and hazel. I would plant these in abundance and let woodland perennials run through them. I would choose English bluebells, spurge and common ferns along with snowdrops and aconites. Copying the work of one of my favourite designers, Mein Ruys, I would thread a sinuous dead hedge through my wood to add nesting places for birds. This dead hedge is made by driving in stakes at intervals to hold long branched prunings in place. “Meadows” I hear you cry. The more I look at, read about or experiment with these the less keen I become. 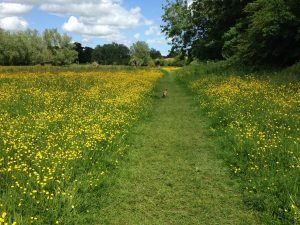 Why not leave patches of grass unmowed and achieve the buttercup sea by letting the sward grow up? You might find it handy to go on a scything course as you will need to cut and clear the vegetation later in the year. Knautia macedonica also a scabious but is dark maroon with wiry stems which it weave lightly through other plants. Anthricus sylvestnis Ravenswing – black cow parsley. Lastly, stay your secateurs come the autumn. The colours will drain from your perennial flowers but there is no need to hack them back to ground level. Leaving the ghostly silhouettes of tall and stately plants may do three things: provide birds with seed and an armature for frost and a subject for movement to boot. All you have to do is control yourself from being too much in control. Let nature be.